Utah's Elite Pointing Piper was produced her at Utah Pointing Labs and is yet another example of the dogs we are striving to produce. A nice off switch when at home, but when you let her out to hunt or run her on marks on land or in the water she runs hard and hits the water hard. No tip toeing in with this dog. She has a real nice personality and her puppies should excel in hunt test, field trial or just a good hunting home. She is bold in the water and hunts hard in the upland field. We put Piper's CPR title on her fall of 2014 and passed the test with flying colors. Spring of 2015 we put her JH title on her and she smashed it with ease. She has a 100% pass rate when it comes to testing. She was very easy to train and has been trained up pretty close to a Senior level, but is just mainly a hunting dog. Piper is co-owned with one of my good friends and we are happy to have her here as part of our kennel. 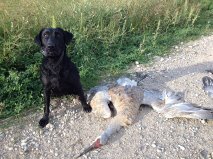 Piper is used primarily as a gun dog and family companion. Piper has hunted quail in Arizona to ducks and geese off the Great Salt Lake here in Utah, accessing the hunting grounds with a air boat. She is quiet in the kennel and is a pleasure to have around. She marks and points extremely well. If you are looking for a nice pup, you will want to check out Piper.